What is a teleseminar or webinar? For anyone not yet familiar with teleseminars and webinars, these are seminars conducted over the phone and web. A teleseminar or webinar takes internet technology and opens up learning to the world. What is the difference between a Teleseminar and Webinar? A teleseminar is listened to via audio only, whereas a webinar may include video or images. The limitation with webinars is the quality of video streaming is still quite rudimentary. How is a Teleseminar presented? The seminar is presented in two ways: over the phone and live through the internet. This means that people can particpate from anywhere in the world. Webinars and teleseminars are more than lectures. They are interactive. Callers can submit questions before and during the event. In addition, callers can interact with the speakers during the teleseminar, phoning in with questions during the event. How do I listen to a teleseminar? All these details will be supplied to you upon registration and you will have the choice of how you call in. Once you go to the teleseminar dial in page, you will be able to submit questions before or during the event. Many events give you the options of downloading the event after it has been recorded. You will need to check each individual event for details. 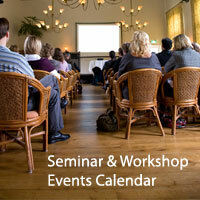 Depending on the terms of the seminar, recordings can be downloaded for personal use on one's computer or Ipod etc. As long as you register in advance for the event, you will be able to download the teleseminar as an MP3 recording after the event within the allocated download time. How do I get the MP3 recording? Because the seminars are recorded, participants can access recordings later if they are not able to attend live - as long as this is an option for the event and participants have pre-registered for the call.